FAITH should be such that it can Move Mountains! 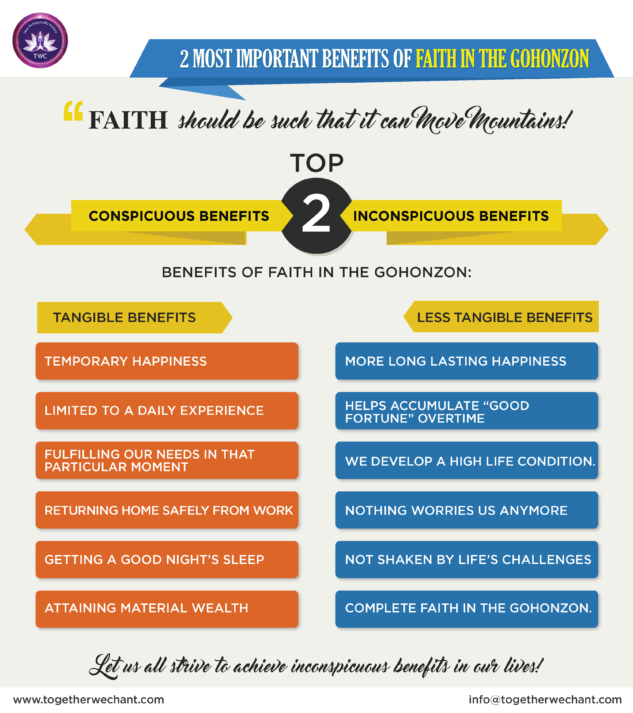 In other words, when we have extremely strong Faith in ourselves and The Gohonzon, we are able to develop a life state which is unshakable by any of the challenges or struggles we face on a daily basis, in our lives. Through our chanting of The Lotus Sutra, we develop an extremely strong inner core with “an inexhaustible reservoir of good fortune”. These are the more visible & clearly obvious benefits, of being protected at all times, in our daily lives. These are also referred to as the Tangible benefits. Every day examples of conspicuous benefits include: returning home safely from work, getting a good night’s sleep, ability to overcome an illness, improve our relationships, attaining material wealth in terms of a good house, car, workplace etc. But overall, these are limited to a daily experience, fulfilling our needs in that particular moment. Let us also discover a more long-lasting happiness that comes to us in the form of this second type of benefit, Inconspicuous benefits, as we chant Nam Myoho Renge Kyo, The Lotus Sutra. These are the Less-Tangible Benefits! These appear in our lives in the form of “Good Fortune” that we accumulate overtime with our practice of chanting The Lotus Sutra. These may appear slowly yet steadily! The Inconspicuous Benefits may not appear in our lives on a day to day basis.But over the years we will certainly be able to develop a higher life condition in which we are happier & have become more strong and capable individuals. We will not be shaken by any of life’s struggles! The Faith in self and The Gohonzon eventually will enable us to keep on moving forward to achieve our own goals as well as ready to help others too, with their life journeys as well ! Eventually it is a blessing to be able to accumulate such inconspicuous benefits through chanting Nam Myoho Renge Kyo. This is because we develop our lives to a point where nothing worries us anymore, as we develop complete faith in The Gohonzon. Therefore, let us all strive to achieve inconspicuous benefits in our lives, as we grow our faith stronger & stronger, in The Gohonzon, with each passing day! This article is my own interpretation and understanding of the practice of chanting The Mystic Law. It is not a replica of any articles or related information available online. Download our Android App here and be a part of our online worldwide Kosenrufu mission!